In order to produce a tangible Conference output, we strongly encourage you to participate in the preparatory discussion through the RCE Portal here. You will need to login to the site before being able to post comments. Please contact the Global RCE Service Centrerceservicecentre@ias.unu.edu if you are not yet registered on the site. The RCE Portal will also be the venue by which RCE projects may be nominated for the RCE Award. More information regarding the nomination process and eligibility criteria is available here. RCE Kitakyushu will host the 6th Asia-Pacific RCE Meeting and International Symposium on “Inspiring Sustainable Lifestyles – based on the perspective of ESD –” on 20-22 October. The meeting aims to strengthen collaboration among Asia-Pacific RCEs and to contribute to the global RCE movement through thematic, operational and strategic discussions. The meeting will also focus on developing a strategic roadmap for promoting ESD towards 2014 and beyond. At the International Symposium, which is open to the public, RCEs are also invited to present their flagship projects in the context of thematic areas such as Schools, Youth, Biodiversity, Community and Disaster Risk Reduction with a special focus on multi-stakeholder partnerships and community empowerment. Registration is now open through the conference website http://2013aprce.com. For those who are interested in participating in the meeting, please register yourself before Friday, 20 September. Please note the deadline for financial assistance and submission of the case study abstract is Friday, 6 September. We look forward to your active participation. More than 50 people are already confirmed dead following a maritime collision between a ferry and a cargo ship off the central port of Cebu in the Philippines. In addition to the tragic loss of life, there is an impending environmental disaster looming as oil spills from the ships as a result of the collision. RCE Cebu is working diligently to help prevent further damage to the environment and they are urgently seeking advice from the RCE community and its partners for how best to cope with the spreading oil problem. If you have multisectoral initiatives for resolving such a situation or if you have other advice or thoughts to share, you are kindly asked to send along those best practices to Cherry Piquero-Ballescas cballescas@yahoo.com. The European RCE co-Coordinators have created a short text on possible strategic priorities for the European region and opportunities for engagement on these initial thoughts. They are asking all interested RCEs to share their thoughts on these priorities via the RCE Portal. To read the text and join the discussion, click here. You will need to login to the site before being able to post comments. Please contact the Global RCE Service Centrerceservicecentre@ias.unu.edu if you are not yet registered on the site. The two-day capacity development workshop was a great opportunity for the participants to share their RCEs’ experiences – both successes and challenges – in regard to governance and coordination of the RCEs as well as transformative learning processes and to discuss how to expand and strengthen the network and collaboration within the region. Prof. Dr. Elizabeth S. B. Abenga, the Acting Deputy Vice Chancellor of Masinde Muliro University of Science and Technology and Mr. Hillary Mibei from the Kakamega County Commissioner opened the workshop with warm welcome and emphasized the significance of this workshop as an opportunity to facilitate multi-disciplinary collaboration and networking in addressing various sustainability problems. Several candidate RCEs were also invited and actively engaged in the group discussion in which they could gain know-how on successfully initiating the RCEs in the region. Participants made a field trip to Buma Farm where innovative sustainable agricultural practices were demonstrated by a member of RCE Kakamega. The workshop was attended by more than 70 participants from RCE Kakamega, RCE Greater Nairobi and RCE Greater Pwani, RCE Greater Eastern Uganda, candidate RCEs, National Environment Management Authority (NEMA) and UNU-IAS. To download presentations and photos from the workshop, please visit:https://www.ias.unu.edu/sub_page.aspx?catID=1849&ddlID=2713. CEE Himalaya, RCE Srinagar and Channel Mountain Communication, under the Government of India and UNDP Global Environment Facility supported project "Mainstreaming Conservation and Sustainable Use of Medicinal Plant Diversity in Three Indian States", celebrated the International Day for Biological Diversity 2013 at Dehradun, Uttarakhand. CEE has been engaged in this project in developing a communication strategy and tools for facilitating effective implementation of the project. Besides creating awareness about biodiversity, the celebration promoted conservation and cultivation of medicinal and aromatic plant diversity across the Indian Himalayan Region, particularly in the State of Uttarakhand. The celebration included guest lectures, discussions and films. One of the short films raises concern on the rapid loss of biodiversity adversely affecting the health care of 80% of rural and poor people in India; it focuses on Medicinal Plants Conservation Areas (MPCAs) and Medicinal Plants Development Areas (MPDAs) set up under the project. The video is uploaded on YouTube and can be viewed here: http://youtu.be/5YpgqMCuIMw . Resilience is a term that is gaining currency in conservation and sustainable development, though its meaning and value in this context is yet to be defined. Searching for Resilience in Sustainable Development, authored by an RCE Severn member and one of its partners, examines ways in which resilience may be created within the web of ecological, socio-economic and cultural systems that make up the world in. The authors embark upon a learning journey exploring both robust and fragile systems and asking questions of groups and individuals actively involved in building or maintaining resilience. Through a series of wide ranging interviews the authors give voice to the many different approaches to thinking of and building resilience that may otherwise stay rooted in and confined by specific disciplinary, professional or spatial contexts. The book documents emerging trends, shifting tactics and future pathways for the conservation and sustainable development movement post Rio+20, arriving at a set of diverse but connected conclusions and questions in relation to the resilience of people and planet. 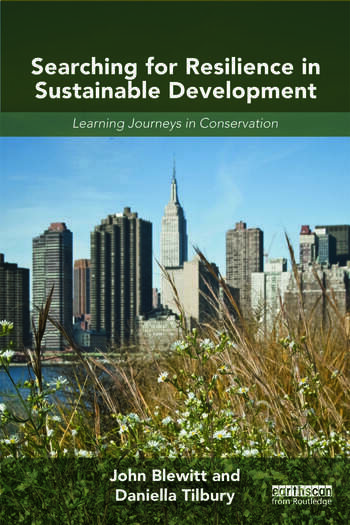 This book is ideal for students and researchers working in the fields of conservation, sustainable development, education, systems thinking and development studies. It will also be of great interest to NGOs and government officers whose interests and responsibilities focus on conserving or reconstructing biodiversity and system resilience. For information about ordering the book, visit: www.routledge.com/books/details/9780415524896/.